So began the litany of reactions to sharing my latest trip plans with friends and family. Pretty much no one in my Southern California cultural circle could understand why I would pack bags and fly across the country, only to end up in Kansas City, Missouri. I must admit that I also had my reservations at first. Accurate or not, my visualization of Kansas City included rolling prairies, historical pioneer reenactments, and the image of a small Midwestern town. 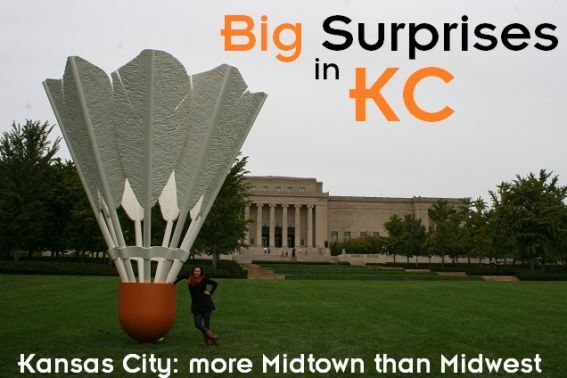 KC is actually one of the most hip, most culturally up-to-date (ah… there’s the pun! ), and most modern cities I’ve been to. I was continually surprised by the city’s dedication to art and museums; impressive scenery, architecture, and fountains; and diverse focus on theater. I love exposing my kids to fantastic art. Although I am not an artist, I love the connection, empathy, and emotional response that art evokes. Kansas City is quickly becoming an artist’s wonderland as the Crossroads Art District, a recently re-vamped neighborhood of art loving and creating urbanites, has become a major focus in the city. Inspired kids can get creative themselves at Kaleidoscope, an ingenious and environmentally proactive art space for children, provided by one of KC’s most prominent businesses, Hallmark. The Kemper Museum of Contemporary Art also frequently offers free classes and activities for children to interact with and explore art. If your artists in training get hungry, head to the Crayola Café. Your kids will enjoy the expected crayon based coloring activities and you’ll love that the restaurant doesn’t sacrifice food quality and taste. The adult-friendly fare is surprisingly delicious. KC’s Nelson-Atkins Museum of Art is one of the finest art museums I have visited across the entire United States. The collection is immense, spanning basically every period of art history, and the museum is surprisingly filled with lots of visiting children. Kid-friendly programs, tons of outdoor space to run and play (with massive shuttlecocks to run around to boot), and an audio tour designed just for children makes it an even greater draw. Need more motivation to explore art in Kansas City? All of the art-based activities listed above are free to visit! In addition to fine art museums, the city also offers numerous culturally significant museums including the National World War I Museum at Liberty Memorial – the United State’s only official museum covering the Great War. Older children can explore the history and impact of this war in beautiful, state of the art, hands on exhibits like nothing else in the country. 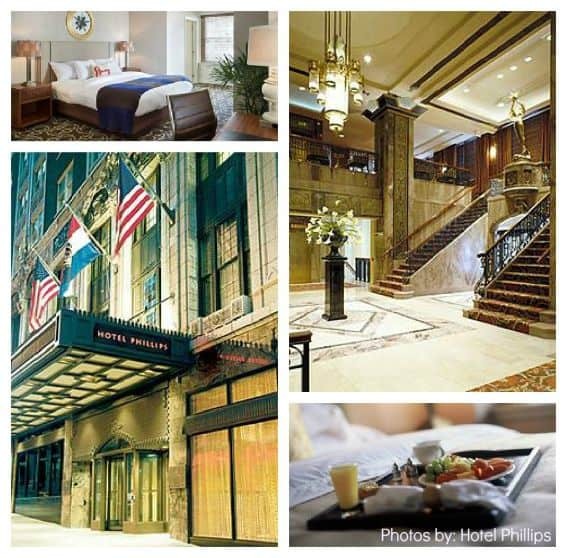 If you are looking for a hip and artsy place to stay in the heart of downtown, Hotel Phillips beautifully weaves the art-loving theme into their stunning and surprisingly comfortable boutique hotel. Built in the height of the art deco movement, the updated hotel retains much of its original artwork and splendor – the lobby is a beautiful and inspirational place to sit, relax, and listen to live music with your kids. The hotel’s accommodations are top notch, the staff is incredibly warm and friendly, and the location is ideal. Kansas City is known as the City of Fountains – this is no exaggeration: outside of Rome, there are more fountains in KC than any other place in the world! Beautiful fountains and architecture can be explored all over the city and I haven’t yet met a child who doesn’t fall in love with fountains! KC’s most famous, the J.C. Nichols Fountain by Henri-Léon Gréber, is situated in Country Club Plaza, a beautiful shopping center chock full of impressive Spanish architecture and a surplus of striking fountains. Union Station, built in 1914, features impressive architecture as well, and is a great place to spend a day. Enjoy the refurbished train station’s architecture while enjoying museums, shopping, and restaurants. 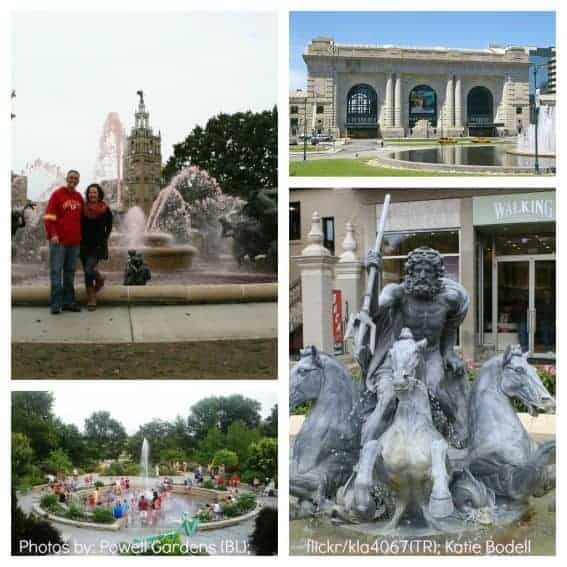 Take your kids on a Fountain Scavenger Hunt in KC. The scenery in and around KC is also amazing. I was so surprised by the rolling green hills, lush foliage, and spectacular lakes. Just outside KC, Powell Gardens brings the sophistication, beauty, and nature inspired awe of a massive botanical garden to visitors. Year round festivals and events at the Gardens give kids plenty of chance to explore natural beauty. Kids can explore through the gardens and learn about the importance of utilizing local food sources. Speaking of food. While you visit The Plaza, be sure to visit KC’s famous (and #1 Zagat rated BBQ) Jack Stack at the Plaza. You won’t regret it. 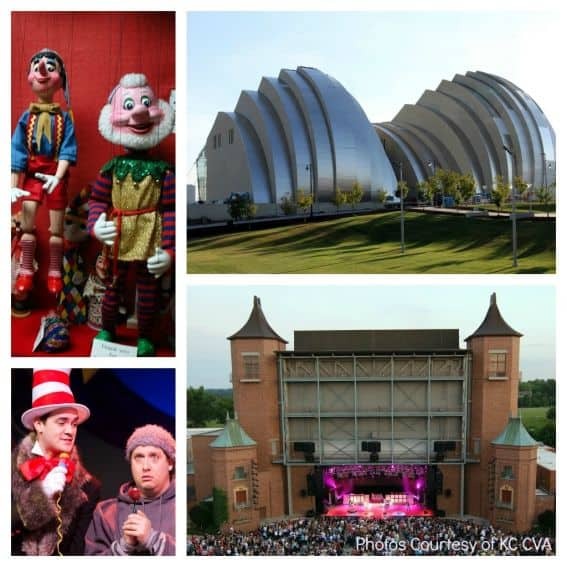 Families visiting and exploring KC have numerous options to enjoy world-class theater. If you happen to visit during the summertime, head to the Starlight Theater – a massive and beautiful outdoor theater that produces family-friendly entertainment for your warm summer nights. The downtown skyline’s Sydney Opera Hall-esque Kauffman Center for the Performing Arts is more than just a pretty face. Inside, families can enjoy a two meticulously designed performance spaces featuring Broadway touring theater, the KC Ballet, numerous concerts, live events, and shows. Crown Center boasts the Coterie Theatre, a stage dedicated exclusively to kid-focused productions for children of a variety of ages. At the Puppetry Arts Institute, your little ones can browse through beautiful puppets, take in a show, and even create their own puppet to take home. Puppets are a great way for young children to begin to explore theater; kids can enjoy this institute from a very young age. Catch a pre-show dinner at Webster House, a refurbished 1885 schoolhouse featuring local artisan ingredients and seasonal menus. The food here is fabulous. Disclosure: Although I received complimentary admission and lodging at many of the above attractions while completing a media tour of Kansas City, all opinions are my own. That looks surprisingly fun and awesome! 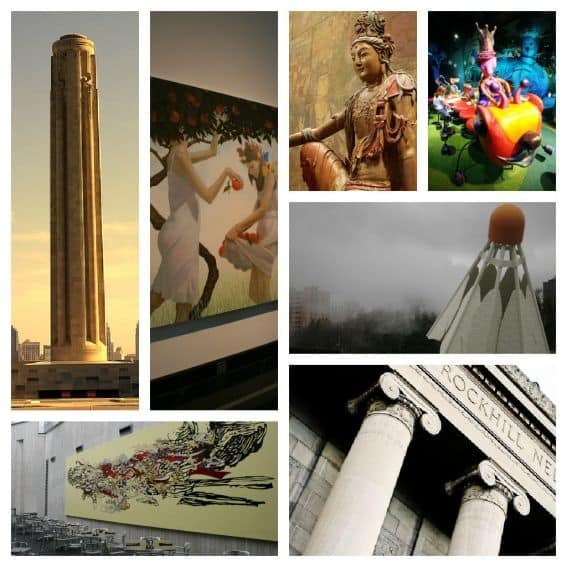 Kansas City is one of our favorite Midwest destinations! Barbeque is a given when you visit Kansas City. I would also encourage any visitors to skip the numerous chain restaurants that prevail in metro areas with highly developed suburbs and check out the dozens of high-class, yet affordable, local restaurants. The Plaza, The Crossroads, and Westport areas of KC are all brimming with fabulous chefs and and innovative eats. KC is a family area and you won’t be turned away if you bring your kids to any of the many stellar, non-chain dining choices. Check out Yelp or any of the foodie shows (No Reservations; Diners, Drive-ins & Dives) that have stopped in KC for recommendations. Thanks for the tip, Slicey. Two more KC blog posts coming up in the next couple weeks….